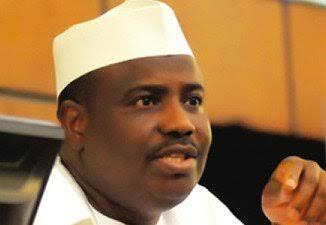 Six pro-Muhammadu Buhari governors were in Sokoto state yesterday to beg their Sokoto counterpart, Aminu Tambuwal, to reconsider his decision of leaving the APC for the PDP and R-APC coalition. Daily Sun gathered that the governors were led to the parley by the Chairman, Nigeria Governors Forum, Alhaji AbdulAzeez Abubakar Yari. Others were Abubakar Bello of Niger, Bello Masari of Kastina, Kassim Shetima of Borno, Jubrilla Bindow of Adamawa and Abubakar Badaru of Jigawa, all of the All Progressive Party (APC). Although the governors had earlier announced that they were in the state to condole with Tambuwal, over attacks by suspected armed bandits which killed 39 people at Tabanni village, it was gathered that their real intent was to prevail on the governor not to leave the party. Shortly after the condolence ceremony, where Yari spoke on their behalf, Tambuwal ushered the visiting governors into an inner room where they held a closed-door meeting which lasted for about two hours. Thereafter, an aide of one of the visiting governors told Daily Sun the reason for the visit. He said, “They were in Sokoto to condole with the governor and to discuss politics, especially Tambuwal’s plan to leave the APC for the People’s Democratic Party. They will never disclose this to the media."